A man was reportedly robbed and shot in front of his wife and child while getting water from a Watermill Tuesday night, January 19, 2016. 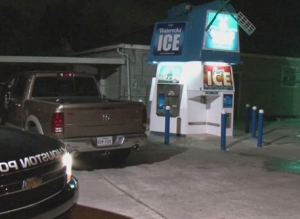 According to KHOU News, the robbery occurred outside of a “Watermill located at East Crosstimbers and Farnsworth,” around 9:30pm. A father was apparently getting water when two to three suspects held him at gunpoint and demanded money and personal belongings. Once the victim complied, the suspects apparently shot him in the neck and turned the gun on his wife and teenage daughter, who had been sitting inside their car. The suspects reportedly fled once the mother threw her cellphone to them. The father was transported to Ben Taub Hospital in serious but stable condition, per media reports. Police have not yet identified the suspects, once again leaving Watermill patrons concerned for their safety. Three gunman apparently robbed and shot a victim outside a Watermill on Veterans Memorial and Antoine Drive in May 2015. Patrons have a right to be safe and secure while on the premises of the establishment that they are visiting. Given the reported history of violence at another local Watermill, The Murray Law Firm questions the level of security provided to Houston Watermill patrons and whether this shooting may have been prevented. What parking lot security measures, such as bright lighting and surveillance cameras, were in place to protect patrons and deter crime? Were any additional security precautions implemented by the Watermill or parking lot owner or management following reports of a May 2015 robbery-shooting at another location? Generally, property owners are required to protect all patrons legally on the premises from any foreseeable harm. Should the facts of this matter reveal that the owner or management of the property where the Watermill was located failed to provide adequate security to protect those on its premises, the victim may elect to seek justice and pursue a legal claim for his injuries. Given the complexities of pursuing a negligent security case, it is imperative that the victim retain an experienced attorney who can ensure the preservation of any and all evidence that may support such a claim. Based upon its prior experience in handling property security negligence claims, The Murray Law Firm suggests that photographs and a thorough, unbiased inspection of the property will need to be performed immediately, before any evidence may be repaired, damaged or destroyed.